This month, I reached 12 million readers. Yep! Twelve with six zeros. But you won’t find me on the Christian Booksellers Association’s best-seller list. In fact, you won’t even find this month’s sales on amazon.com or even your favorite brick and mortar bookstore. Nope! I appeared in the devotional magazine, The Upper Room, which has a circulation of 7 million. And I write a monthly column for the Presidential Prayer Team’s newsletter, which goes to 5 million subscribers. Plus, that doesn’t include several thousand readers on my hopeandhumor.org website. Here’s the harsh reality. The average book sells only 500 copies in its lifetime. And 98 percent of books sell 5,000 copies or less. I’ve been fortunate that my book, The Imitation of Christ: Classic Devotions in Today’s Language, is in the top 2 percent of sales, since it sold 5,000 copies in one year. But let’s compare numbers. Five thousands readers in one year vs. 12 million in one month! Not much of a contest. Everyone has a message they want to share or a story they want to tell. And they dream of a large audience to read their words. But they choose to put all their time and effort into writing a book and then work pitching it to publishers who seem as interested in it as a cat. If you want respect, write a book. If you want readers, write an article. I’ve had 20 books and over 2,000 articles published, but people are much more impressed with my books than my 100 times more articles with several thousand times more readers. So, yes, you get more respect with books؏book signings, TV and radio interviews, etc.؏but you get exponentially more readers with articles! For instance, my work has appeared in Christianity Today, Decision, Focus on the Family, Guideposts, Leadership, Ministry Today, Rev., Today’s Christian Woman, The Upper Room, The Whittenberg Door, War Cry and many more. And I’ve written letters to the editor published in TIME and USAToday؏again, an audience of millions! Because periodicals aren’t risking thousands of dollars on one story, they are more willing to risk running the story of an unknown author. So, you not only can get many more readers, but it’s so much easier to get published in periodicals. And because they aren’t charging $24.95 for hardcover, they have thousands more readers. 1. Unless you’re incredibly famous, were involved in a well-known news story (think 9/11) or have an amazing story (Heaven Is For Real for instance), a book publisher probably won’t be interested in your book. 2. Book publishers want authors who have a “platform” from which to promote their book: a busy national speaking ministry, a popular TV or radio show, a well-trafficked Web site with 100,000 daily visitors, etc. 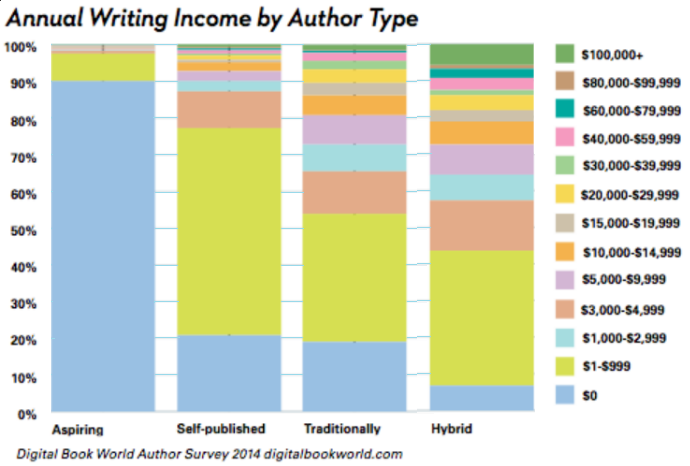 Without these platforms, a royalty publisher won’t be willing to gamble $50,000 or more on publishing your book. If you want notoriety, write books. If you want money, write articles. Thousands of periodicals are looking for you and your article, testimony or short story! And you will reach hundreds of thousands؏or even millions؏of readers with that magazine. That’s a reality! And here’s the most amazing statistic: The average book sold 500 copies!